Samsung may have launched Fortnite alongside the Galaxy Note 9, but its exclusivity for the Korean giant’s compatible devices was short-lived. However, Samsung is now giving Galaxy Note 9 users a chance to win big, including a chance to jump in a game with the biggest Fortnite streamer Ninja, under its ‘Galaxy Squad’ contest. Yes, Samsung has partnered with Tyler ‘Ninja’ Blevins for this contest to give its users a chance to grab a once-in-a-lifetime opportunity to play and stream Fortnite with one of the best players on the face of this Earth. Fortnite made its way to Android alongside the launch of the Galaxy Note 9 earlier last month, where users gained access to a limited-edition ‘Galaxy’ skin which looks sort-of awesome. Well, it’s now finally time to redeem that Galaxy skin (if you haven’t already) and don it to win prizes worth over $5,000 by participating in this contest. Samsung will be picking 4 winners for these prizes, including a 65-inch Q9FN QLED TV, a 49-inch CHG90 QLED gaming monitor and a pair of AKG N700NC headphones. 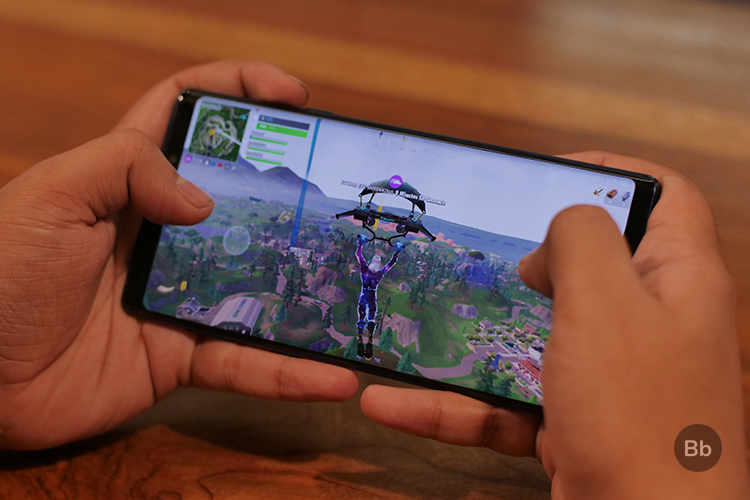 To take part in the contest, as you may have already guessed, you will need to use your Galaxy Note 9 (or Galaxy Tab 4) device to play Fortnite and record your gameplay (using my favorite Game Launcher feature on Samsung devices). You will then need to post the gameplay recording on Twitter or Instagram with the hashtag #contest, as well as #NinjaGalaxySquad in your post. Also, you will need to follow @SamsungMobileUS on Twitter or @samsungmobileusa on Instagram to enter the contest. It has already kicked off and will continue up until 30th September, so you have close to a fortnight (pun intended!) to submit your entries. The contest allows only one entry a person so the stakes are quite high for winning the four prizes and the grand prize. Even if you’re not one of the five lucky winners, Samsung will also pick 100 runner-ups, who will also receive a pair of AKG N700NC headphones as consolation. So, will you be participating in this contest? Excited to bust out your best moves to play with Ninja? Do share your thoughts with us in the comments below.